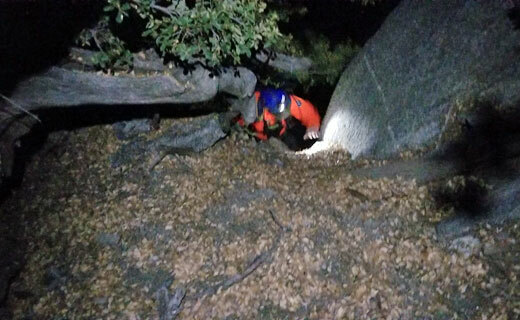 The call came out at 4pm, hoist for a stuck hiker (Alex) on the Skyline trail. Most helicopter hoist missions are quick and easy, this would be the exception to the norm. I met Glenn at the aviation hanger and we find out that we have a stuck hiker about 8,100ft up on the side of San Jacinto Mt. above the Skyline traverse. He had hiked, and then climbed, into an area where he could no longer ascend or descend. 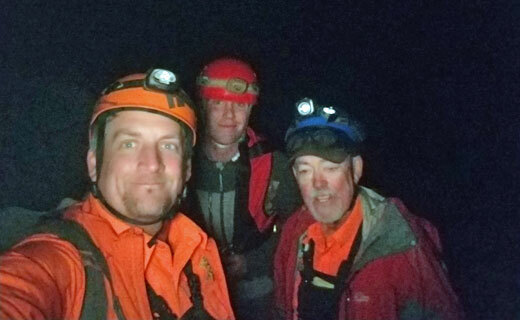 We grabbed a climbing rope and several slings and were quickly on our way with the Sheriff’s Aviation team (Star-9) of Mike Calhoun (Pilot) and Eric Bashta (TFO). After circling the area many times, we finally located Alex. He was on a granite pillar on the side of a cliff. Unfortunately, the terrain was too steep and had too many trees to perform a hoist pickoff. Instead of putting the mission on hold, I let RSO aviation know that they could drop off at a known hoist extraction point at 7,400ft and we would hike from there. While Calhoun held the helicopter steady, Bashta would lower both Glenn and I down without incident. Star-9 proceeded to Palm Springs Airport to monitor our radio traffic and wait for the extraction call. Glenn and I started our hike up the Skyline trail for about 100ft before ascending a 50-degree gulley heading towards Alex. With the sunlight fading, night quickly set upon us. Under headlamps the gulley eventually ran out and we were met by granite faces. We roped up and Glenn proceeded to belay me while I climbed until the rope ran out. I would then belay Glenn up to me. This process was repeated 3 times wrapping slings around trees and boulders for anchor points. My final climb was up the 20’ Pillar to reach Alex. He was very cold, shivering, and extremely thankful to see another soul. After getting Alex a jacket, I created a “Swiss Seat” out of webbing for him to use as a harness. I then belayed Alex back down off the pillar and back down to Glenn before down climbing myself. 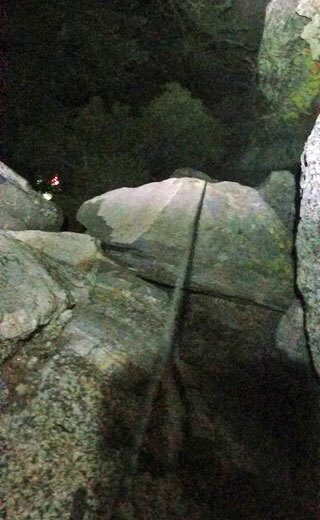 We would then setup 3 more belay stations to get back down to the “level” 50-degree gulley. From there it was a quick hike down to our insertion point. Glenn contacted Star-9 and within minutes they were hovering overhead. We suited Alex up in a screamer suit which he gave truth to the name. As he was being lifted there was a resounding “Woooaaah!”. Aviation dropped Alex off and returned to pick up Glenn and myself. I finally made it back to my house at 1am the next day…. Not quite the quick hoist mission. What went wrong? Alex was hiking the Skyline trail, one of the hardest trails in North America. 8000ft of elevation gain over 11miles. At the traverse around 7,500ft, he lost the trail and proceeded to head straight up the side of the mountain. He didn’t realize that most of the slopes have about 200ft of steep granite before cresting the top. He continued climbing and eventually couldn’t go any further and was too sketched out to descend. He rightfully made the decision to stay put and call 911. If he had attempted to move, any mistake would have resulted in a fall with extreme injury or possibly worse. RMRU Members Involved: Glenn Henderson and Eric Holden. Sheriff’s Aviation Team (Star-9): Mike Calhoun (Pilot) and Eric Bashta (TFO).